Shikatani Lacroix has successfully transformed many major brands in its 25-year history, with many representing a complete immersive brand delivery. 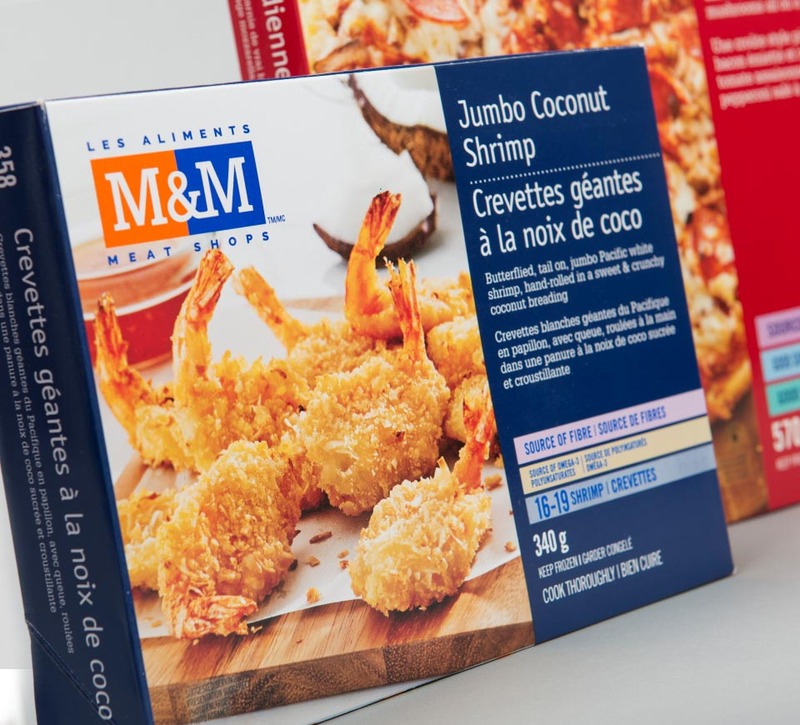 Shikatani Lacroix partnered with M&M Meat Shops to completely reimagine the entire consumer experience, transforming everything from the retail environment, to the website, and designed a completely new look and approach for its packaging of more than 400 SKUs. 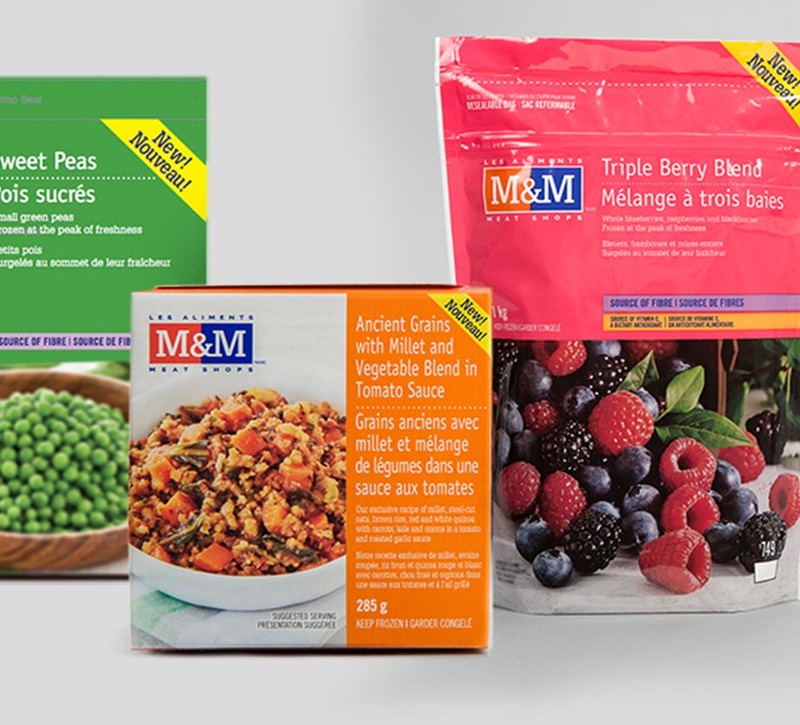 M&M Food Market is a leading Canadian retailer of frozen foods. 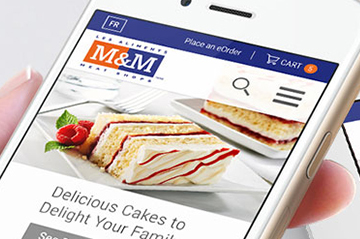 Lagging sales, declining top of mind awareness with consumers (especially among the Millennial segment), and a lack of understanding what the brand had to offer, prompted M&M to modernize its image to remain relevant in the marketplace and attract a new generation of customers. 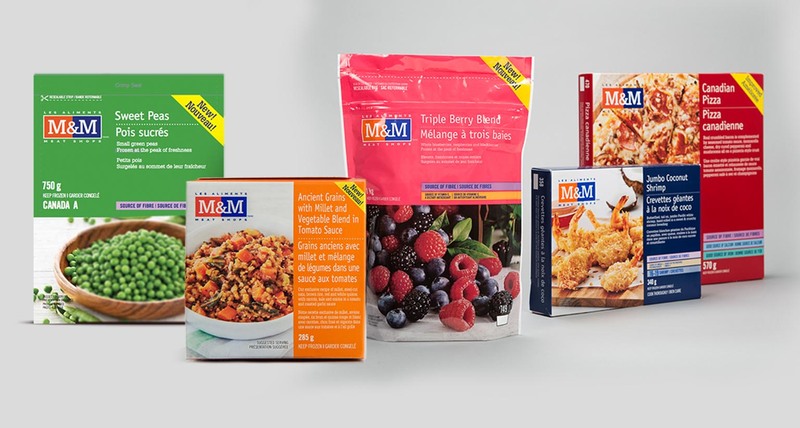 As a result, M&M initiated the largest brand rejuvenation initiative in its 35-year history, touching all elements of the business from product and packaging to the sign on the outside of the building as it underwent a name change from M&M Meat Shops to M&M Food Market. 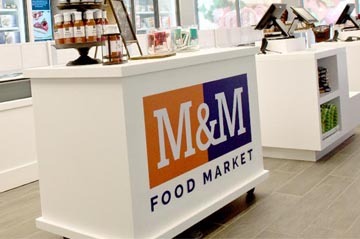 M&M Food Market’s shopping experience was challenging and uninspiring. 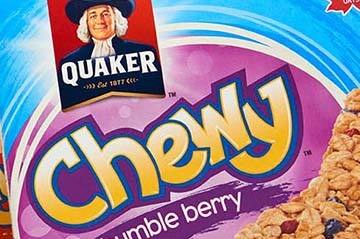 Its current packaging was a solid white cardboard box with the name of the product printed in plain text. 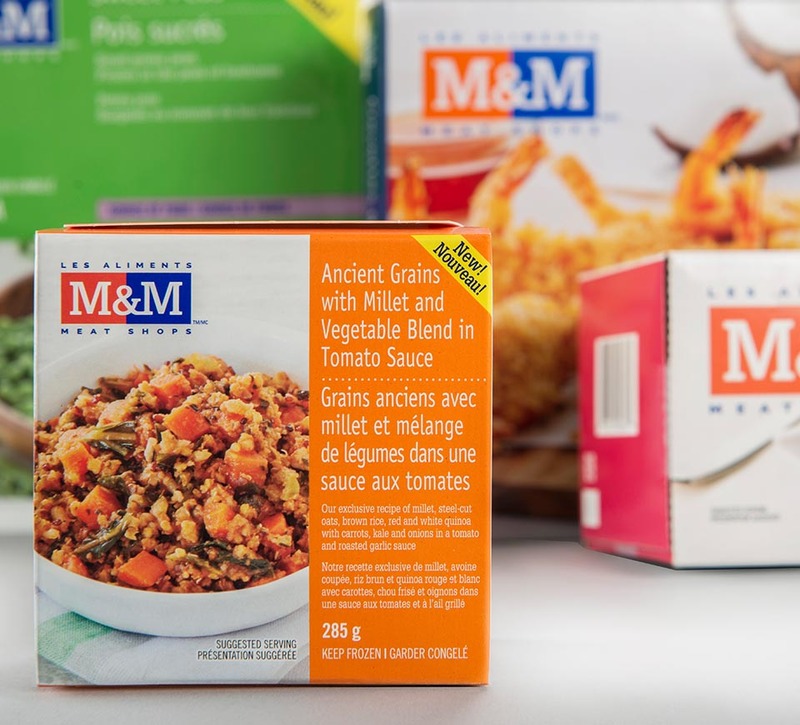 With 400-plus SKUs, the packaging needed to play a large role in improving the brand experience by increasing customers’ appetite appeal, navigating them through the store, and guiding their purchase decisions. It had to do all this while not alienating existing customers and reassuring them that the new packaging did not equate to higher prices. 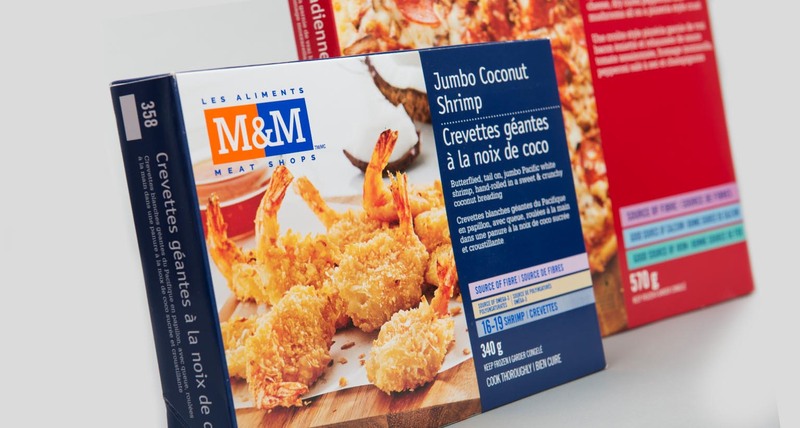 Three design directions were put into research to determine which would be the most successful at generating appetite appeal for the packaging and helping to improve the overall shopping experience. 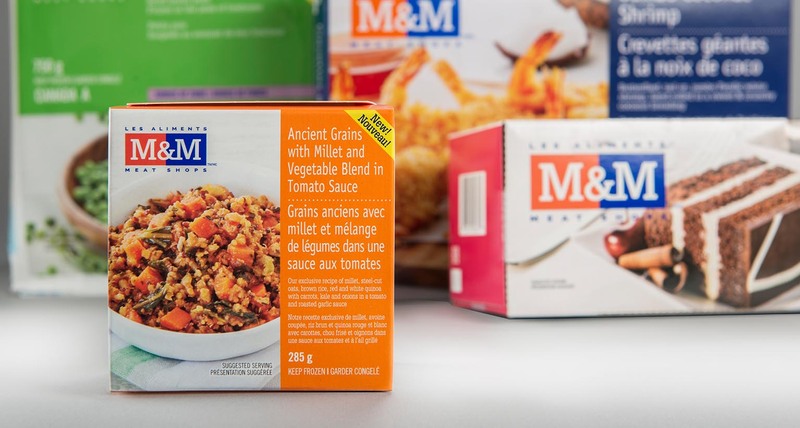 M&M wanted to elevate the entire experience and inspire families to enjoy cooking and eating, and to allow them to see the full range of options available. 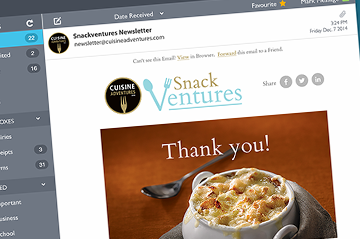 Since this was a redesign of the entire experience, the new design needed to reflect a consistent message and work with the new sales choreography, which leveraged employees as meal ambassadors rather than clerks. 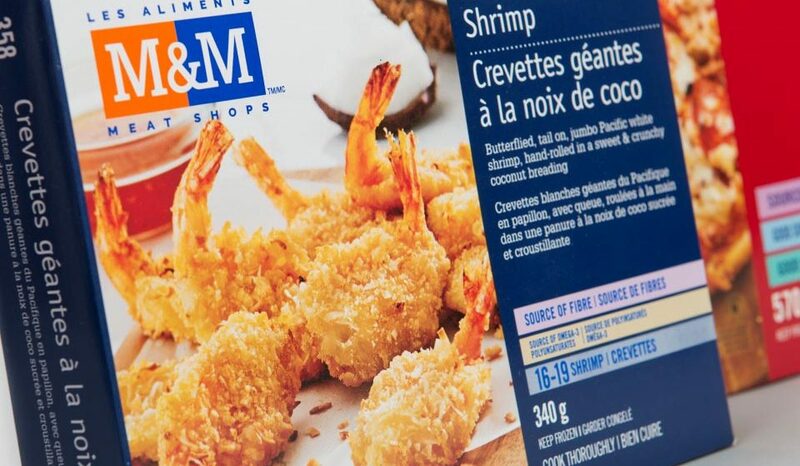 Three design directions were put into research to determine which would be the most successful at generating appetite appeal for the packaging and helping to improve the overall shopping experience. 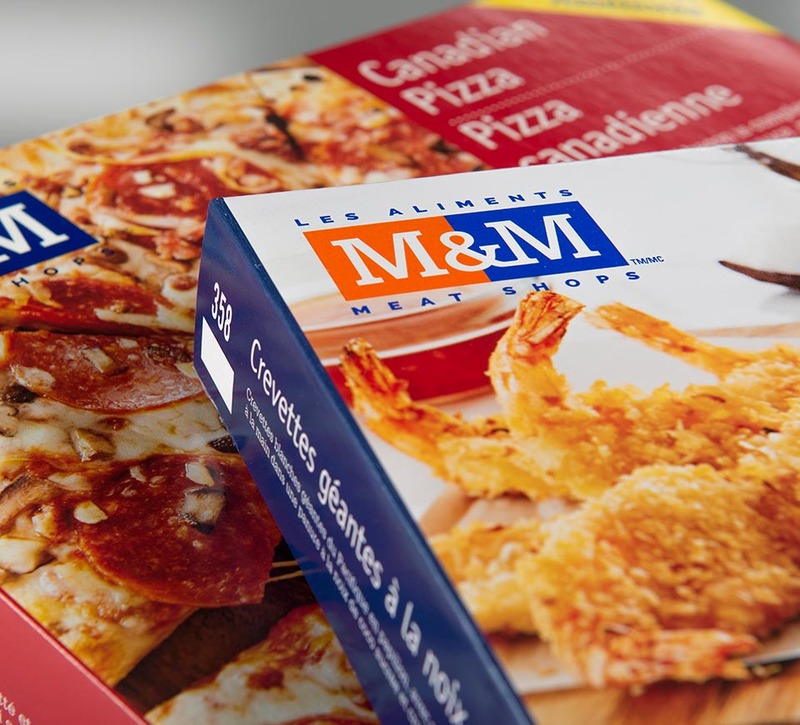 The winning design introduces full color photography of the delicious food offerings to the packaging, which is color-coded to help customers differentiate between the various food categories. 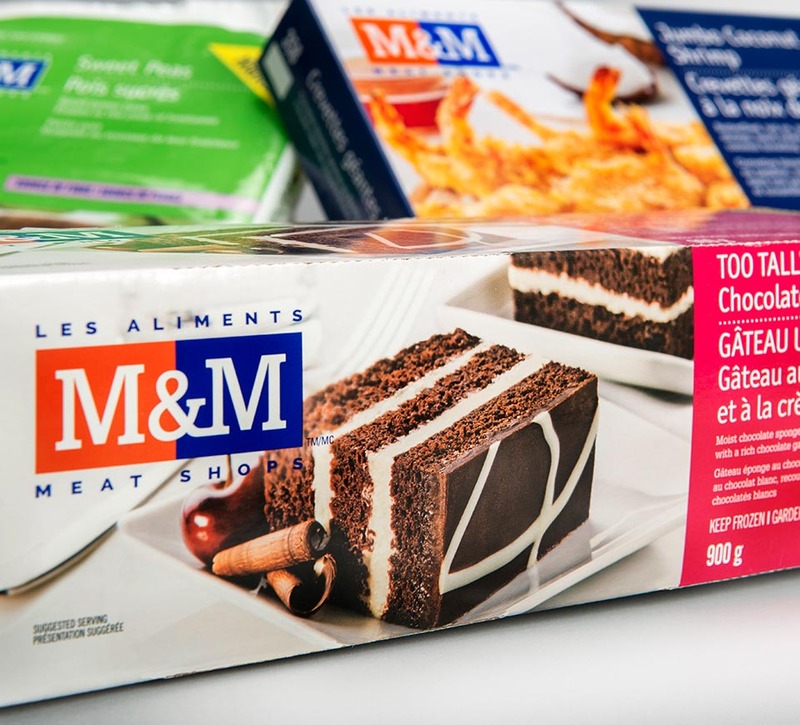 The color coding on the packaging corresponds to the colorful store signage above the product freezers, further assisting customers in navigating the store. 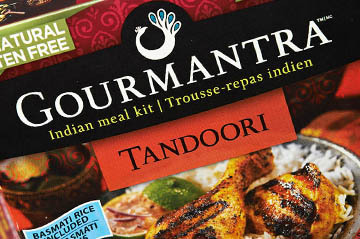 Customer feedback has been extremely positive and so have sales results. 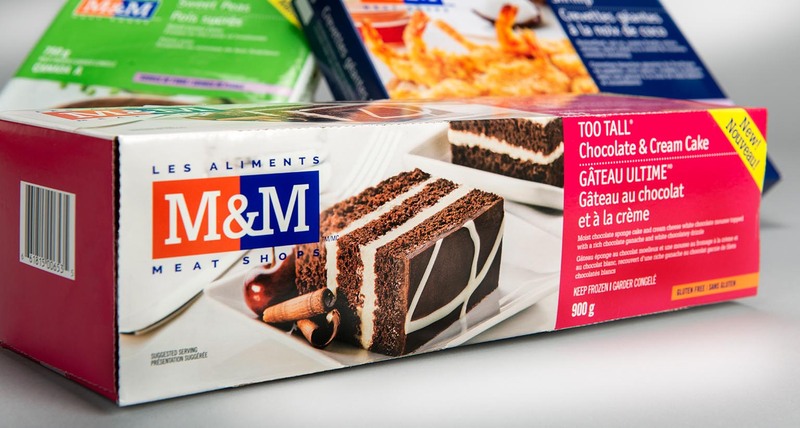 The new packaging has much stronger visual cues, which help customers navigate the store and find what they’re looking for quickly and easily. Shikatani Lacroix played a key role in the transformation of the M&M Food Market brand by helping design an immersive retail experience for its customers through the enhancement of multiple consumer touchpoints from the staff uniforms, website and digital signage, to the brand identity, store layout and packaging. 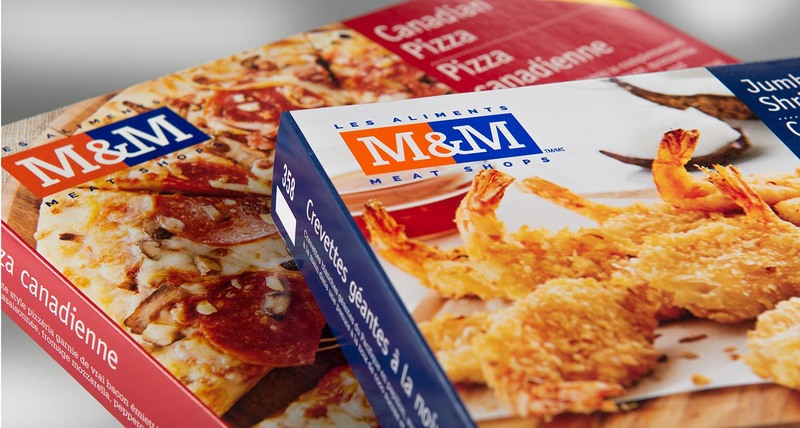 Shikatani Lacroix partnered with M&M Meat Shops to completely redesign its major consumer touchpoints, from the retail environment and product packaging, to its website and name – now M&M Food Market.